Partnering with the Good Shepherd foundation BTCG offers people on low incomes loans, financial support and education. We enable people to take control of their own financial wellbeing and feel in control of their financial lives. The no interest loans scheme provides individuals and families on low income access to safe, fair and affordable credit. There are no fees, no charges, and no interest. Maximum loan amounts may vary, but credit can start from $300 up to $1500 for essential goods and services. Once your application is approved, repayments are set up at an affordable amount over a 12 month period. With NILS, no credit checks are made as this is a program based on trust and respect. WHAT ARE THE LOANS FOR? Loans are generally available for the purchase of essential goods and services. Some other items as requested. DO I QUALIFY FOR NILS? Show a willingness and capacity to repay. *In certain circumstances, the community organisation may consider amending the eligibility criteria upon loan application. With manageable repayments and a respectful assessment process conducted by Break the Cycle , it works through a process of circular community credit. When a borrower makes a repayment to NILS, funds are then available to someone else in the community. BTCG then works along side our clients, coaching them to their agreed outcomes and moving them towards financial indendancy. For more information on NILS please contact the office on 02 9829 8898. We offerg Finanical Counselling this service can help our clients better understand their finanical circumstances to enable options for change and goal settings. We host an outreach service for legal advice to local residents on the last Tuesday of the each month between 12pm and 3.30pm by appointment only. Counselling is a process where you can talk about your problems in a safe environment, to someone who is professionaly trained. Our Food and finanical assistance program identifies immediate needs of our clients and asseses the appropriate form of response to help. This can include day to day living needs, food and emotional support. 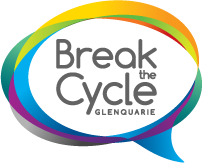 Break the Cycle liaises with local services and agencies and advocates on behalf of our clients for the best possible outcome. As part of the Food and Finanical assistance we interview clients in crisis, potentially offering food; Gas, Electricity assistance, water for private housing and Telstra finanical assistance. We interview clients on Tuesday,Wednesday and Thursday betwwen 9.30am and 2.00pm. Break the Cycle is currently part of the State Work Development Order program. This allows people that are eligible to take part in a range of activities to reduce their outstanding fines. This system helps with basic needs that helps get their life back on track. It is also an opportunity for participants to work in an environment that helps them move forward in life giving them a sense of achievement and opportunity to evaluate changes needed through mentoring, coaching, education and life skills courses. This is helping people with a second chance and providing a catalyst for change. Break the Cycle provides a on site chaplain that is available for the community and clients. Chaplaincy is our pastoral first response for people; providing advice and support in a safe space that allows clients to reflect on where they’re at and where they would like to be. This is more informal and flexible and adaptive to the needs of the individual. By building relationships through support and engagement it creates a stronger community and provides a strong link between services, the organisation and the community. Our chaplain works by example, instruction and encouragement. Chaplaincy services are currently available on Tuesdays and Thursdays Please call us on 02 9829 8898 or email stuartw@btc.org.au for more information. We’re pleased to work with those who find themselves at various stages in the criminal justice system, whether they’ve had their first encounter with the police or have served time in prison and everything in-between. We seek to encourage clients to take responsibility for their actions and to provide positive pathways forward as they seek to make the changes they recognise will benefit them. Our services are recognised by the local Corrective Services and Local Courts and we are pleased that on the basis of involvement with our programs a number of clients have seen their sentences commuted and have subsequently gone on to serve out their bonds and community service orders productively. Break the Cycle Men’s shed provides a shared community space for blokes to come together from our community to share their skills, gain knowledge, meet new mates, and build positive relationships as they enjoy working together. Are you interested in Joining Men’s Shed? BTCG Men’s Shed offers in the way of skills and equipment in Carpentry, Electrical, Welding, Mechanical, Computing, plus a wealth of life knowledge, friendship and experiences. If you have never used tools or have limited experience then our members will assist with the skills you require. Our mature member are available to assist and mentor you as you learn new skills and support. We require participants to observe all Work Health & Saftey rules for the safety of all. There is an annual membership fee of $10 and $5 per visit which includes drinks and lunch. We have both metal and wood turning lathes, an array of hand and power tools, stick welding gear and are always on the lookout for more donations. Do you have something that needs fixing, repairing or building? Our blokes are always looking for new projects. If you have something that needs to be built or repaired why not contact our mens shed and they would be more than happy to provide a quote. All money raised is put back into the Men’s Shed and Break the Cycle. By supporting our Men’s Shed your supporting our community! Break the Cycle offers an onsite food shop that is available for the community to come and shop at. Offering food and non perishable items at low costs allows those in need or on a tight budget to do more with their money. Tinned food and Bottled Food. There is a joining fee of $2 for all members of the pantry. Simply fill out an application on your first visit to the Pantry. How much is a usual shop? For $20 you can select whatever you like from the Pantry to fill your pantry basket. There is a wide selection of pantry items which changes weekly. How often can you shop. You can shop at the Pantry once a week. Our Community Pantry is not-for profit and all monies raised go towards supporting the Pantry and Break the Cycle. By you supporting the Community Pantry you are giving back to the Community.